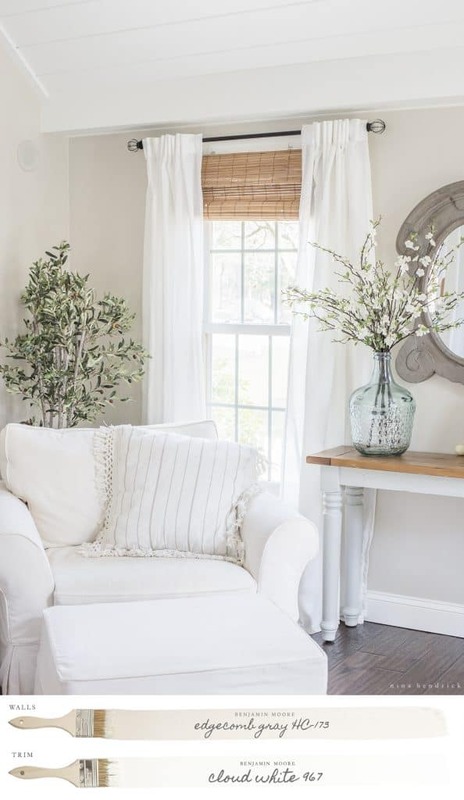 Gather resources for Natural and Neutral Family Room Inspiration and get tips and tricks for moving forward in a tricky space. In the renovation story of any home, I feel like there are always rooms that are tricky. Maybe they are awkwardly shaped, there isn’t enough light, or it’s hard to distinguish how they fit into everyday life. In our home, we have a couple of these rooms. In spite of the fact that I can go into anyone else’s home and completely envision how to design a particular room, sometimes I struggle with my own. A “shoemaker’s children” type of situation for sure! 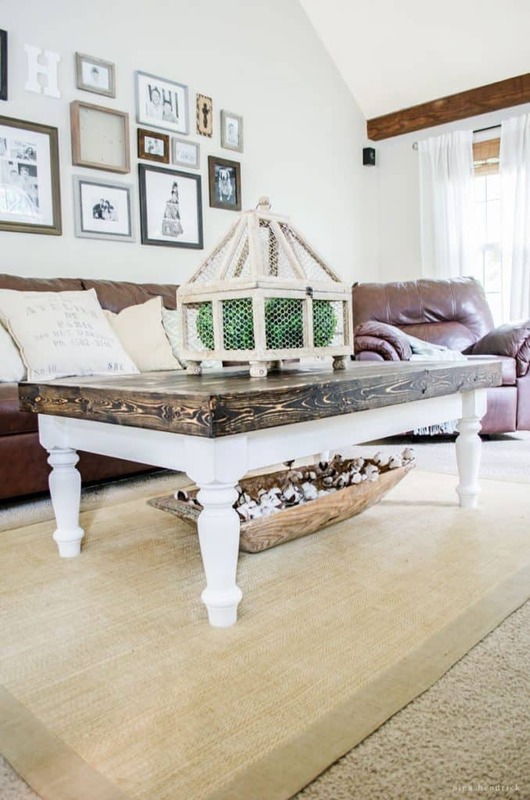 In our current home, my biggest challenge has been our family room. While I can envision and execute certain aspects of the room, I have a really hard time bringing everything together into a cohesive design. I admit that in the past I have avoided spending too much time in this room because it makes me feel a bit incompetent and embarrassed. After all, this is supposed to be what I do! Why can’t I master this particular room? There are certainly challenges. It’s a shallow but wide room, which has forced me to be a bit creative with furniture layout. It has a cathedral ceiling, which means two of the walls are very tall. I have had to consider a custom rug size due to the challenges with the dimensions of the room and fireplace. We have really taken our time working on the space, which has allowed my plans to evolve. I always choose neutral and timeless finishes for permanent structures, so I am still happy with everything we’ve done so far, in spite of the almost five years that have passed since the beginning. To catch you up, our first step was when we painted the formerly yellow walls in Benjamin Moore’s Edgecomb Gray. A year or so later, we covered up the staggered brick fireplace with soapstone-look leathered granite and marble-look quartzite. We added inexpensive but pretty window treatments. 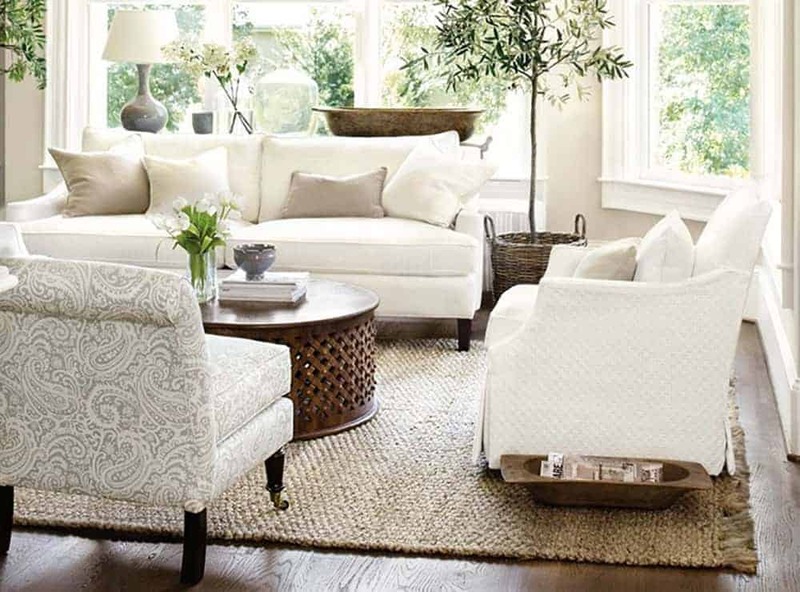 Last year we replaced our discount store leather sofas with Pottery Barn Comfort Sofas (post coming soon!). One misstep I feel I made is the gallery. I think it looks small and insignificant on such a huge wall. My plan for the cathedral wall is to install board-and-batten and paint the whole thing in Benjamin Moore’s Cloud White to match the trim. I’m picturing a gallery of a few larger pieces of art that will be evenly spaced on the wall instead of the sofa (since the sofa is not able to be centered on the wall anyway). I also plan to finally complete phase 2 of our fireplace makeover, which is the built-ins. This is another project that has been a long time to come! I think it will really pull the room together and provide us with much-needed storage. 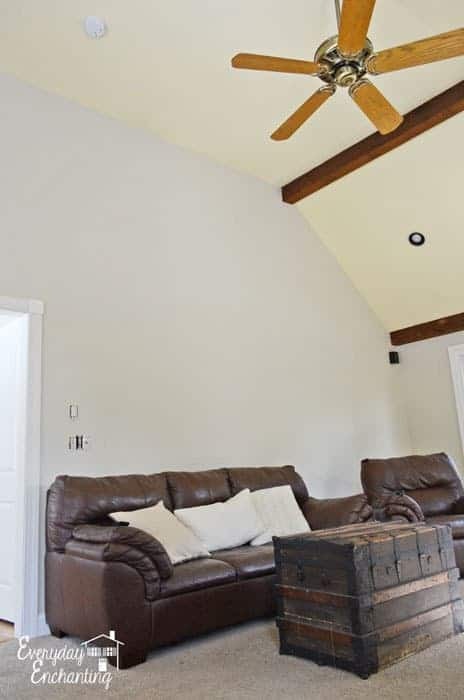 We have recently completed the process of covering the yellow-painted ceiling with white tongue-and-groove. I will be sharing the details soon! The photo above gives a sneak peek of what the room looks like today. Beyond that, all of the remaining improvements are decor! Storage is definitely the name of the game in this room, so I will be adding a lot of baskets and bowls, as well as possibly a curio cabinet. I’m going to wait until the perfect piece jumps out at me for the wall where the scroll mirror currently resides. I also have my heart set on a Mora-style clock eventually! There are definitely more greens than I’ve ever used, but I’m finding that I’m really drawn to an organic feel. I will make sure to share more as I begin to pull this room together! LOVE WHAT YOU HAVE DONE SO FAR. I LOVE PAINTED WOOD SO WAS HAPPY TO SEE WHAT YOU DID WITH THE BEAMS ETC. CAN’T WAIT TO SEE THE ROOMS PROGRESS. 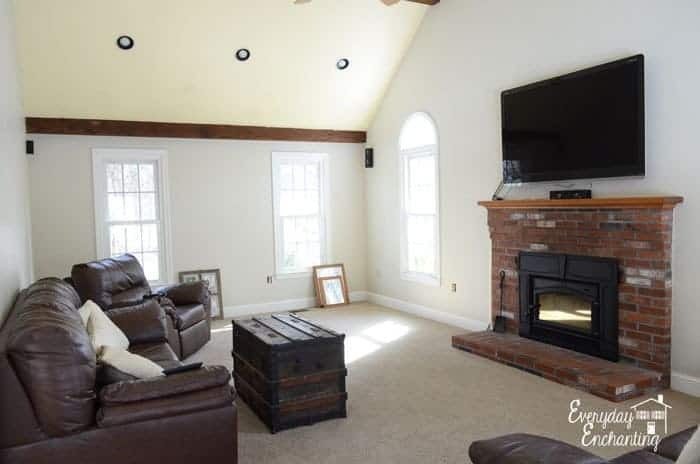 I love your inspiration board, especially since I am dealing with almost the exact same elements in my family room – cathedral ceiling, beams, fan, shallow but long area, and brick fireplace. We have changed it up some -(green walls to gray), added the board and batten on sofa wall (really helped lessen huge expanse of wall) and bought new furniture. 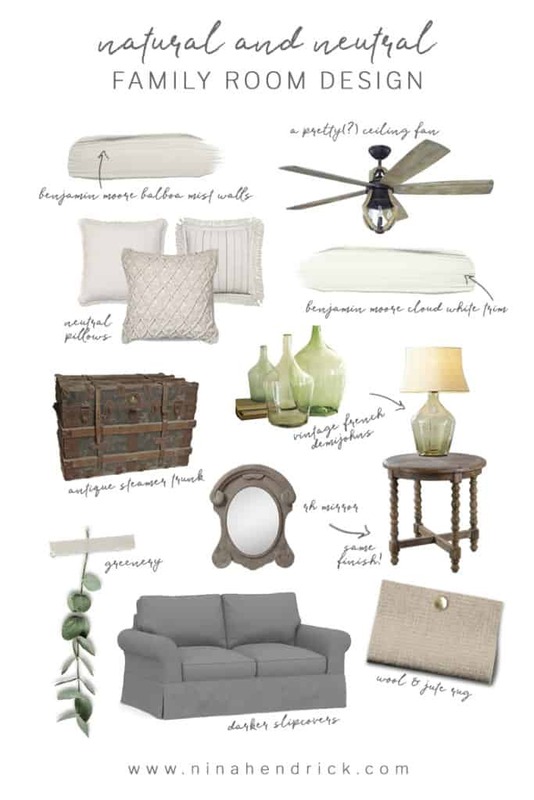 I am still wanting to do a ceiling treatment, so, very anxious to see your full room reveal.